Property 28: Cabin w/ Fire Pit & Decks - Walk to Lake Harmony! 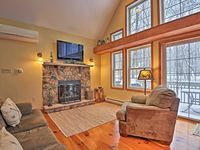 Property 45: Cozy Pocono Getaway Close to Jack Frost and Big Boulder! Property 46: Charming Arrowhead Lake Cottage - Walk to Beach! Property 48: 4 bedroom, 2 bath rustic cabin right in the HEART of Split Rock. This little cozy cottage was such an amazing place to stay! Such a warm home environment. The hot tub was so relaxing and the house was very clean and comfortable! Prefect place to get away from the world, while also being close enough to get a bite to eat nearby or do some hiking! We would definitely stay here again! Thank you!